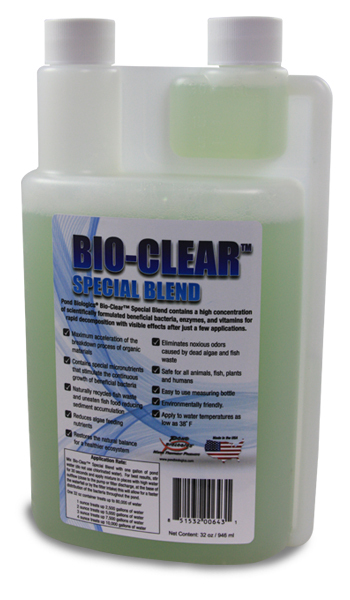 Pond Biologics® Bio-Clear Special Blend™ contains a high concentration of scientifically formulated beneficial bacteria, catalyzing enzymes, and essential vitamins that quickly and effectively break down organic matter. These specially selected, vitamin infused bacteria strains maximize the decomposition process for faster, superior result. Maximum acceleration of the breakdown process of organic waste. Contains special micronutrients that stimulate the continuous growth of beneficial bacteria. Restores the natural balance for a healthier pond. Eliminates noxious odors caused by dead algae and fish waste. Environmentally friendly. Safe for all animals, fish, plants and humans. Easy to use measuring bottle.